Trip Report: Fullerton, CA to Portland, OR. We left our house in Fullerton at about 7:30 a.m. for the Fullerton station, where we were to catch Amtrak train 763 into LA, and from LA, the Coast Starlight to Portland. We arrived at the station, and I unloaded our bags and went into the station to get a parking sticker for my car. My wife, Donna, waited with our bags at the Santa Fe Express Caf� while I went and parked the car in the parking structure. (An advantage of leaving on the weekend is that the Metrolink trains don't run, so parking is available.) 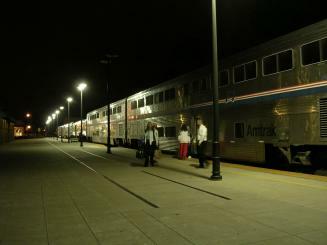 I arrived back at the station just about the time that the Southwest Chief was arriving from Chicago. 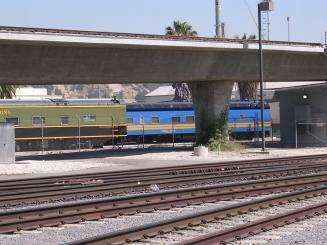 On the rear of train #3 was the private car Tioga Pass, which I think I have seen before in Barstow. Train 763 arrived within a few minutes of the scheduled arrival time of 8:16 a.m. and we managed to get two seats on the first floor of the coach car that we boarded, although the few available seats disappeared quickly, and several people were left standing or sitting on the stairs. We arrived in LA at about 9:55, and it was announced that the Coast Starlight would be arriving on the same track (10), so we got off the train and found a seat to wait for train 14. We watched the Tioga Pass being removed from train #3 and moved to the garden tracks next to the Scottish Thistle. Donna and I boarded our car, #1432 (Arkansas), and went to our rooms, numbers 11 and 12 on the first floor. We had decided to get two sleepers because neither of us likes to sleep in the narrow upper bunk, and we had several Amtrak vouchers that were close to expiration, so we used them for the upgrade. Our car attendant, Shirley Clemens, welcomed us and took our tickets. Our train pulled out of LAUPT at 11:50 a.m., one hr. 35 min. late, and lunch service began about 12:10 p.m. There was a big lunch crowd in the diner, and the service was fairly slow. We sat with a couple from Tennessee who were celebrating their 47th wedding anniversary. 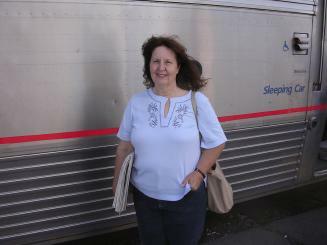 They had traveled from Tennessee to New Orleans, and from New Orleans to Los Angeles on the Sunset Limited. 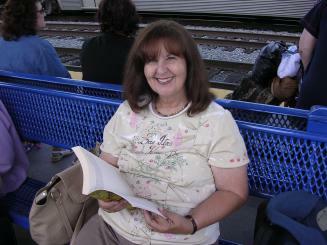 They were on their way to San Francisco, and then were going to take the California Zephyr to Chicago. They said they were thoroughly enjoying their trip. All four of us ordered the open face prime rib sandwich, which came with a salad. My wife and I both thought that the prime rib was overcooked. For dessert, I had the key lime pie and Donna had the chocolate bombe. Both were good. We left Oxnard at 1:28 p.m., 1 hr. 33 min. 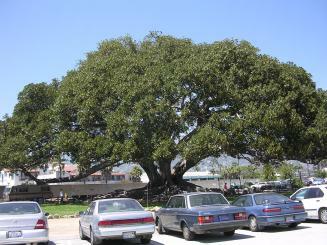 behind schedule, and continued into Santa Barbara, arriving about 2:20. Wine tasting began at 4:00 p.m. The Pacific Parlor Car attendant, Jose, was very enthuastic in promoting the wines, as well as the souvenirs that he was selling such as hats, playing cards, baggage tags, etc. The wine tasting consisted of two whites, a sauvignon blanc and a Riesling, and a red, a petite Sarah. I bought a bottle of the sauvignon blanc which was consumed that evening. We left San Louis Obispo at 5:00 p.m., 1hr. 17 min. behind schedule. 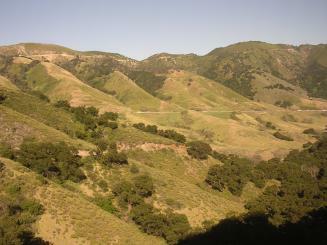 At 5:40 we passed southbound #11 at mile marker 233, shortly after ascending Cuesta Pass. We pulled into a siding alongside of #11, and they passed us on the main. We then backed out of the siding and continued on our way. At dinner, we sat across from a couple from Eugene, OR who were on their way home. They had boarded our train in San Louis Obispo, where they had gone to celebrate their 10th anniversary, with reservations for dinner and the night at the Madonna Inn. Unfortunately, their train from Eugene to San Louis Obispo was so late that they arrived after the restaurant had closed. They did not seem particularly thrilled with their Amtrak experience. I had catfish for dinner, which was quite good, although I asked for it blackened (a menu option), and it was served covered with a tomato sauce instead. Our dinner companions both ordered the New York steak, asking for it blackened, also without success. Donna ordered the chicken teriyaki, which she said was good. Although neither one of us needed dessert, I managed to put down a cup of vanilla ice cream and Donna a piece of key lime pie. The service was poor and our waiter was unfriendly. We left Salinas at 8:22, 1 hr. 46 min. behind schedule, and San Jose at 10:01, 1hr. 22 min. behind schedule. It was encouraging that we seemed to be at least holding our own on the schedule. 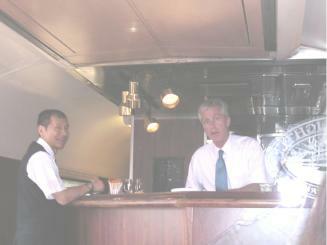 The movie in the Pacific Parlor Car was Finding Neverland. Donna intended to watch it when we finished dinner, but by the time she got down there, the movie had already started so she decided to skip it for tonight. She had Shirley turn down her bed around 9:00 p.m. and went to bed. I stayed up for another hour, making notes of the trip, and turned in about 10:15. I woke up about 5:00 a.m., and we were traveling along the Sacramento River somewhere north of Lake Shasta. We arrived at Dunsmuir at 6:20, where I saw old train sheds, turntable and a snowplow. We left Dunsmuir at 6:24, 1 hr. 20 min. late. 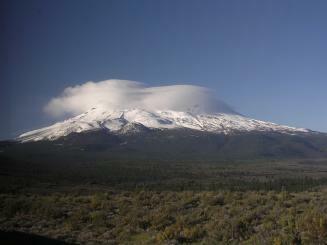 Mount Shasta soon came into view, and was visible for the next few hours. We went to breakfast about 7:00 a.m., and unfortunately, wound up with the same waiter that we had for dinner last night. The service was faster, but just as unfriendly. The job of waiter seemed to be a real challenge for this man. I tried to read the name on his badge, which he wore on a lanyard around his neck, but he always kept his name facing against his body. 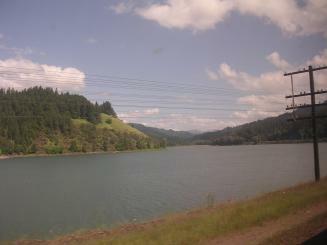 For at least an hour before reaching Klamath Falls, our train was traveling at very slow speeds or stopped. We finally arrived at Klamath Falls at about 10:25 a.m. 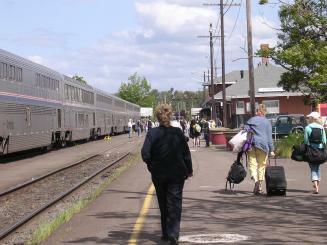 Here the passengers who were connecting with the Empire Builder were taken off and bused to Portland. One of the passengers was listening to his scanner while we were waiting in Klamath Falls and heard the dispatcher tell the engineer coming on duty that he had to wait another 30 minutes in order to meet service break time requirements. When the 30 minutes were up, we finally left Klamath Falls at 11:17, putting us almost 3 hours behind schedule. We went to lunch at noon and Donna and I both had the Angus Burger, which was very good. I refrained from dessert, but Donna went with the ice cream. While we were eating we stopped at Chemult, departing at 12:50, putting us over three hours behind schedule. Upon leaving Chemult, we began our climb up the Cascades, crossing at Willamette Pass. 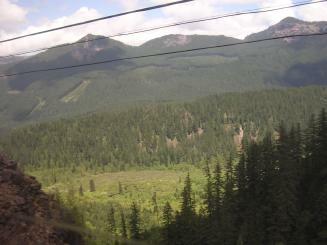 The train passed through 22 tunnels, and spectacular vistas were visible between the tunnels. Descending the other side of the pass toward Springfield, we ran alongside Lookout Point Reservoir for several miles, finally arriving at Eugene at about 4:00 p.m.
Again this afternoon, we had wine tasting in the Pacific Parlor Car. Jose went into his sales pitch for his Amtrak souvenir items and gave his glowing descriptions of the wines, which again were available for purchase for $14 each, except for the Pinot Noir, which was $16. As we were sampling the wines, we passed the southbound #11 at 4:52 p.m., about 10 minutes before we arrived at Albany, OR. I estimated that it was about 30 minutes late. 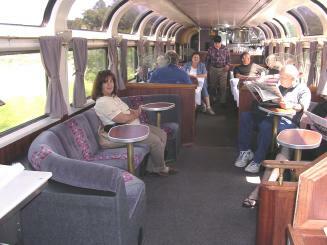 During the wine tasting, the dining car attendant came through the car to take dinner reservations. 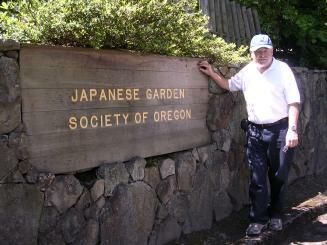 Since it looked like we would not arrive in Portland until about 7:00 p.m., we could have easily had time for dinner. But after eating the cheese and crackers at the wine tasting, plus the previous four large Amtrak meals and desserts, I couldn't face another meal, and told my wife that I was going to pass on dinner, so she did the same. At about 6:50, when it appeared that we were within a few minutes of Portland, the train stopped and the conductor came on the PA and said the signals on the bridge over the Willamette River going into the Portland Union Station had a malfunction, and a signal maintainer had been sent to investigate the problem. 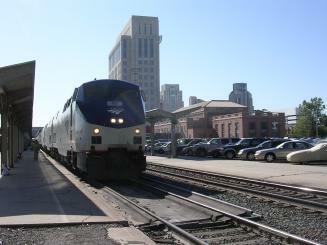 Happily, the problem was resolved quickly, and we arrived at Union Station at about 7:10 p.m., 3hr. 30 min. late. 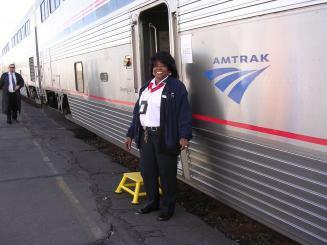 We exited the train, giving Shirley, our friendly car attendant, a well-deserved gratuity. 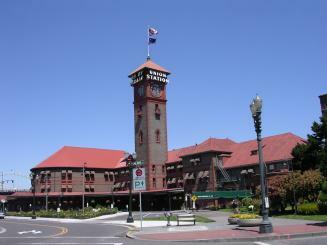 Donna and I walked to the bus station a block from Union Station, and caught the free downtown Portland bus to S.W. 5th Ave. and Stark, which was one block from our hotel, the Vintage Plaza. We both slept in late this morning. Donna is very interested in flowers and gardens, so our plan for the day was to visit the International Rose Test Garden and the Japanese Garden, both in Washington Park. We left the hotel at about 9:45 a.m., stopped at a coffee shop for juice and a bagel, and then caught the TriMet trolley to the zoo station at Washington Park. From the zoo station, there was supposed to be a shuttle to the Rose Garden and Japanese Garden, but when we got there, we found out that the shuttle does not start running until next month. 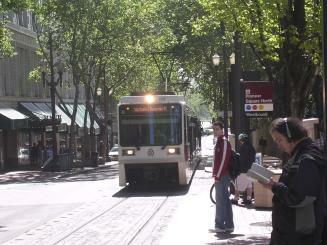 We had to wait for about an hour to catch a TriMet bus to our destination. 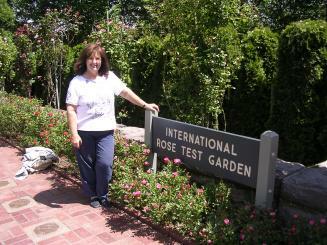 We went to the rose garden first, which has about 10,000 rose bushes of 550 different varieties, covering 4 acres. 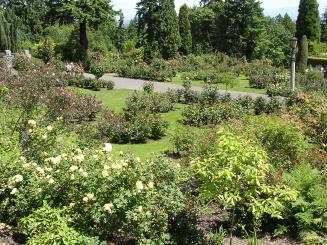 The Rose Garden turned out to be somewhat of a disappointment however, because most of the rose buds had not yet opened. Apparently we arrived a week or two early. 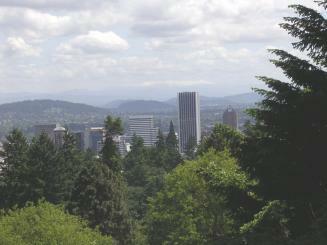 We then spent about one and a half hours walking through the Japanese Garden, which covers 5.5 acres, and offers a good view of downtown Portland and Mt. Hood. The weather was mostly sunny and beautiful, although the top of Mt. Hood was obscured by clouds. We took the TriMet bus/trolley back to our hotel, arriving about 3:00 p.m. We cleaned up at the hotel and then walked two blocks to the Greek Cusina, a popular Portland restaurant where we had a late lunch which we both enjoyed. We got back to our hotel (Vintage Plaza) shortly before the start of the daily wine tasting, which is offered from 5:00 to 6:00 p.m. every day. The hotel is very nice, with a 4 star AAA rating. 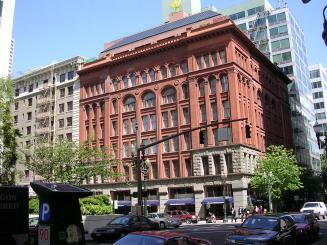 It was built in 1894 as the Imperial Hotel, but has been totally renovated and modernized inside. 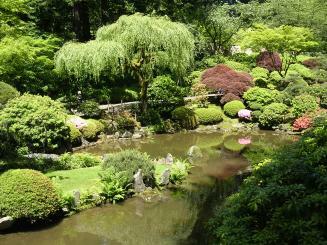 It is also reasonably priced compared to the other 3 and 4 star hotels in the area. We had no specific plans for this morning, so we left the hotel around 9:00 a.m., had breakfast, and strolled around downtown Portland. I stopped at the Bank of America to replenish my leaking wallet at the ATM. We then went back to the hotel, and I brought up the Amtrak website using the hotel's high speed wireless network, to check on the status of our train (# 11). The website showed that it had left Seattle on time, and was expected into Portland at 2:02. We packed up our bags, and checked out at noon, the hotel check-out time. We walked to the bus stop, which was one block from the hotel, and took the bus to Union Station. Again, the weather was perfect, and Union Station, which has been in service since 1896, looked impressive against the clear blue sky. We went to the Metropolitan Lounge (for sleeping car passengers) to wait for the arrival of our train. Donna and I went to our rooms (numbers 13 and 14) in sleeper 1131 (New Jersey). Our car attendant, Joseph Washington, was at the car door to greet us. Again, our rooms were on the first floor, which I was not terribly happy with when I made the reservation, but they were the only pairs of rooms available that were directly across the aisle from one another. While the first floor rooms may not have quite as good visibility of the scenery, we came to enjoy them because of the lack of traffic through the aisle and the close proximity to the bathrooms and shower. Our train pulled out of PDX at 2:51, 26 minutes behind schedule, but an improvement over leaving LAX. We went to the Pacific Parlor Car for the wine and cheese tasting, which began at 3:00. The Pacific Parlor Car attendant was Garrett, who we remembered from our trip from Portland to LAX last June. Garret is very helpful and personable . We had dinner reservations for 5:45. I had the salmon, which was quite good. Donna, in spite of her experience with the overcooked prime rib sandwich on # 14, ordered the prime rib for dinner, and she was again disappointed. Oh well, can't say she wasn't warned. We had dinner with a woman and her mother who had been with us on the Northbound journey on #14, and who we were surprised to see again on #11. They had spent two nights in Seattle, whereas we had spent two nights in Portland. After passing Lookout Point Reservoir, at 7:11 our train stopped at Lookout and we were told by the conductor that there was a brush fire ahead alongside the tracks, and we would have to wait until the Oakridge fire department put it out. We started moving again 30 minutes later and began climbing the Cascades. By the time we got to Willamette Pass, the daylight was gone. We departed Chemult at 9:55 p.m., 1 hr. 50 min. behind schedule. 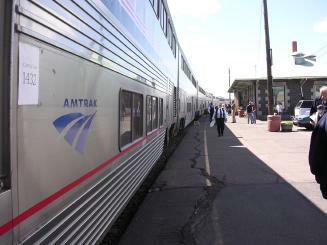 The conductor announced that he expected that we would make up about 30 minutes by the time we reached Klamath Falls. This conductor has been very informative in keeping passengers advised as to what is happening, why we are stopping, etc. I went back to my room to jot down my notes for the day. At 10:00, our room attendant, Joseph, made up our beds, and I put aside my notebook and read for a while before going to sleep. I woke up a little after 5:00 a.m. and looked outside to see where we were. It appeared that we had just passed Redding, which would mean that we were about 3 hours behind schedule. At 6:40, we left Chico, and at 7:00 we passed Northbound #14, which appeared to be about 5 hours behind schedule. It is interesting to note that while all three of the sleepers on this train have the Superliner II type toilets, none appeared to have the altitude related problems encountered on our Northbound trip. I asked one of the car attendants about this and told him that two of our sleeper's bathrooms had been closed from Klamath Falls to Eugene on the Northbound trip. He said that at high altitudes, the toilets can stop working, but this can usually be fixed by cycling the waste treatment power switch. He has done this from one to 4 times per hour, as necessary. We arrived at Sacramento at 9:00 a.m. 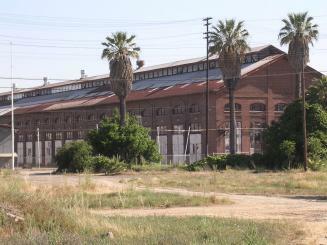 While most of the old SP shops have been torn down, some of the major buildings still stand and are now used by the California State Railroad Museum. 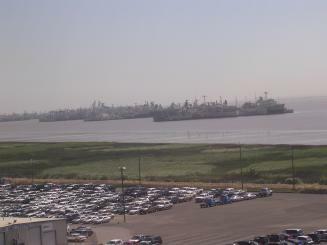 We passed the Navy mothball fleet at Suisun Bay at about 10:10 a.m. Leaving Martinez at 10:30, still 3 hours behind schedule. Donna and I went to lunch at 12:30, and I had a chicken breast sandwich and she had the Angus burger. I declined dessert, but when the waitress came with Donna's ice cream sundae, she also 'accidentally' brought a second one for me. Not wanting to hurt her feelings, I forced it down. 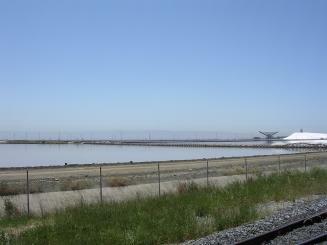 Going along the East side of the bay, we passed the salt collecting ponds near Newark, CA around 1:30 p.m., and could view the blimp hangers at Moffett Field about 20 minutes later. 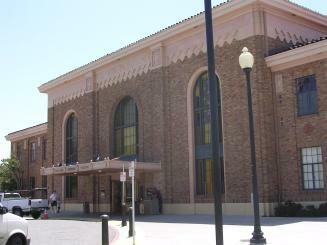 We arrived at the San Jose Station at 2:15. 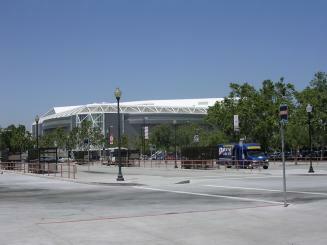 The San Jose Sharks Arena is just across the street. Our train departed San Jose at 2:25, putting us over 4 hours behind schedule. As soon as we left San Jose, it was announced that the afternoon wine and cheese tasting would begin immediately in the Pacific Parlor Car. Having just finished lunch and dessert only an hour and a half ago, the thought of more food was not terribly appealing, but a little wine sounded good, so we went up to partake. Just then, the dining car steward came by taking dinner reservations. I asked for the latest he had available and it was 5:30. Garrett again hosted the wine tasting, with the help of two of the sleeping car attendants. 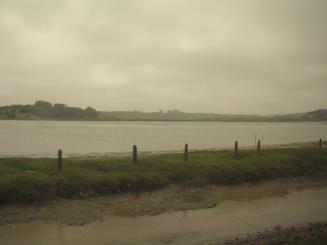 We passed Elkhorn Slough, National Reserve, a little before 4:00 p.m., arriving Salinas at 4:10. 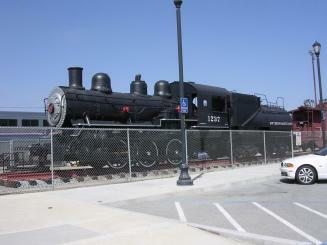 The Salinas station has Baldwin S-10 steam locomotive no. 1237, built in 1918, standing in front of the Station. The goal is eventual restoration. Leaving Salinas at 4:15, about 4 hr. 30 min. late. At 5:40, our train stopped and the conductor walked to the front of train to throw a switch. Minutes later we were moving again onto a siding. After moving onto the siding, we stopped again, and Northbound #14 passed us on the main, apparently just about on schedule. 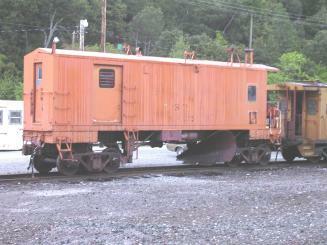 A private railcar (I believe it said Rail America on the side) with an observation platform was at the end of #14. I didn't get the car name, if there was one. Our 5:30 dinner reservation was called at 6:00 p.m. I ordered the special of the day, chicken marsala, and Donna had the roast half chicken. Both were good, but neither one of us was very hungry, so we did not do the meals justice. Both of us skipped dessert. 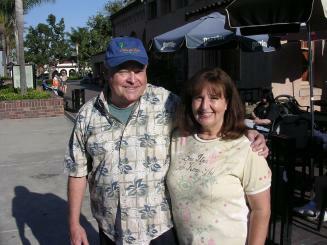 During dinner, we arrived at Paso Robles, leaving at 6:33 p.m., just a little shy of 4 hours behind schedule. 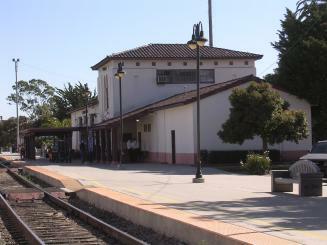 At 7:00 p.m. the train stopped and the conductor announced that the crew had reached their 12 hours of service limit and a relief crew was being sent from San Luis Obispo. We started moving again at 7:30. 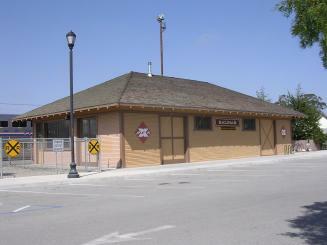 We arrived at San Luis Obispo at 8:10, departing at 8:25, putting us 5 hours behind schedule. 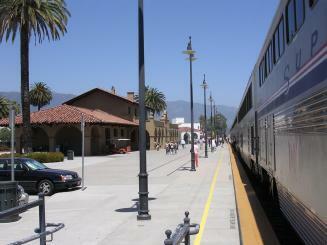 Santa Barbara was our next stop at 10:50, leaving at 11:00. We gained some time between Santa Barbara and LA, arriving in LAUPT at 1:10 a.m., 4hr. 10 min. behind schedule. 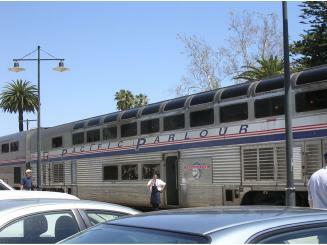 We made our way to the Amtrak bus for our final destination of Fullerton. 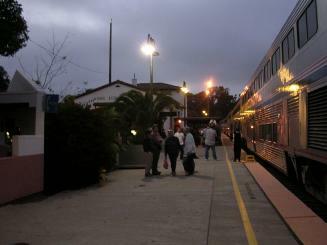 The bus departed LAUPT at about 1:45, and we arrived at the Fullerton Amtrak station at 2:25 a.m. I unloaded our bags from the bus and Donna waited at the station with the bags while I walked over to the parking structure to get our car. I picked up Donna and the bags, and we finally arrived home at 2:40 a.m. This was an improvement over our trip of last June to Portland, when we arrived home at about 4:30 a.m. If I make the trip again, I think that I will consider returning on the Starlight as far as San Luis Obispo or Santa Barbara, and then returning the rest of the way the next day on the Surfliner. 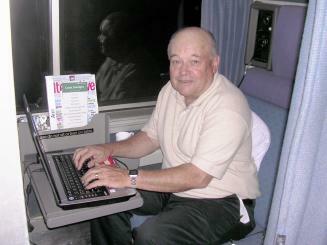 Click here for more travel reports by Fred Dunn!